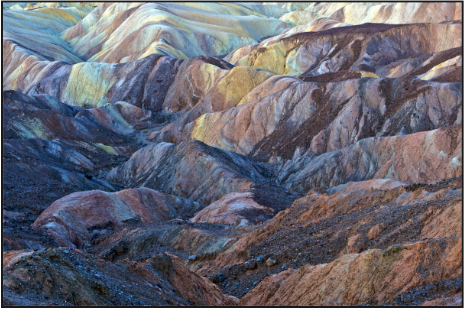 We invite you to explore the magic light and geology of Death Valley. This workshop provides a great opportunity to develop your personal style, enhance your creativity, refine your photographic vision and improve your technical proficiency as we explore the enchantment of Death Valley's subtle colors, brilliant sunsets, canyons, sand dunes, abandoned mines and the strange worlds of the Racetrack, Badwater and the Devil's Golf Course. We visit some of the most popular destinations in Death Valley, however what makes this workshop unique is we also visit locations that are rarely photographed. Day 1 - Sunday: Meet at Stovepipe Wells at 4:00 p.m, please arrive promptly, for orientation and our first lecture. Then meet for an informal dinner in Stovepipe Wells., at 6:30 p.m.
Day 2 - Monday: We leave early for our sunrise shoot of Zabriskie Point and Twenty Mule Team Canyon. Then return to Furnace Creek for breakfast and break. At 11:00 a.m. meet at Stovepipe Wells for our second lecture followed by a break for lunch. After lunch we leave for our afternoon and sunset shoots at Artist Pallete. Day 3 - Tuesday: We leave early for our sunrise shoot at Mesquite Sand Dunes, then return to Stovepipe Wells for breakfast and break. After the break we leave for our full day of shooting at Ubehebe Crater, Tea Kettle Junction, Lost Burro Mine and ending the day at the Racetrack. Day 4 - Wednesday: We leave early for our sunrise shooting at Badwater and the Devil’s Golf Course, then head to Furnace Creek for breakfast and return to Stovepipe Wells for a break. At 11:00 a.m. meet at Stovepipe Wells for our third lecture followed by a break for lunch. After lunch we leave for our afternoon and evening shoot hiking in Golden Canyon. Day 5 - Thursday: We leave for our sunrise hike and shooting at Mosiac Canyon, then return to Stovepipe Wells for breakfast and break. At 11:00 a.m. meet at Stovepipe Wells as we begin our Print Review of participants' work, followed by a break for lunch. After lunch we head west and explore Charcoal Kiln and the west side of Death Valley and Aguereberry Point for our sunset shoot, followed by dinner in Stovepipe Wells. Day 6 - Friday: We begin our last day with a sunrise shoot at the Mesquite Sand Dunes, with morning light illuminating the dunes and mountains in the background. We then return to Stovepipe Wells for a farewell breakfast and departure by 11:00 a.m.
Day 1: 4:00-6:00 p.m. Tools - mastering your system. This session presents techniques to make sure you capture the best possible image in the field, maximizing the potential of your digital camera and lens system. Day 2: 11:00-1:00 p.m. Art - taking your photography to art. We explore the intersection of aesthetics, art and technology and help you refine your composition skills. Day 4: 11:00-1:00 p.m. Craft I - workflow and presentation of your work. Developing a repeatable system, or workflow, is the key to digital image processing and getting the best print or display of your work. Day 5: 11:00-1:00 p.m. Review - what makes a great photograph? During this session we review and comment on your work. Please bring 3 prints of your 'best' work for evaluation, critical review and sharing with the group. The weather in Death Valley in late February and early March is crisp but mild. We've experienced deep blue clear skies without a single cloud or dark grey and stormy with dramatic cloud formations (the latter usually makes for better pictures!). Temperatures around Death Valley during the day range from 73F to 80F. At night it can range from 46F to 53F. The chance of rain is historically about 1%. We will be working at elevations from 4,000 feet to slightly below sea level. The temperatures can drop 10F to 20F as we climb in elevation. Workshop participants are responsible for their own lodging, meals and transportation. There are very few lodging choices in Death Valley, we will use Stovepipe Wells as our base camp. Camping is also available in StovePipe Wells. We will often eat meals together, however you are free to join us or eat independently. The cost of this workshop is $1,295.00. The workshop is limited to 12 participants.